The chronic obstructive pulmonary disease (COPD) Assessment Test (CAT) is a concise health status measure for COPD. COPD patients have a variety of comorbidities, but little is known about their impact on quality of life. This study was designed to investigate comorbid factors that may contribute to high CAT scores. An observational study at Keio University and affiliated hospitals enrolled 336 COPD patients and 67 non-COPD subjects. Health status was assessed by the CAT, the St. Georges Respiratory Questionnaire (SGRQ), and all components of the Medical Outcomes Study Short-Form 36-Item (SF-36) version 2, which is a generic measure of health. Comorbidities were identified based on patients’ reports, physicians’ records, and questionnaires, including the Frequency Scale for the Symptoms of Gastro-esophageal reflux disease (GERD) and the Hospital Anxiety and Depression Scale. Dual X-ray absorptiometry measurements of bone mineral density were performed. The CAT showed moderate-good correlations with the SGRQ and all components of the SF-36. The presence of GERD, depression, arrhythmia, and anxiety was significantly associated with a high CAT score in the COPD patients. Symptomatic COPD patients have a high prevalence of comorbidities. A high CAT score should alert the clinician to a higher likelihood of certain comorbidities such as GERD and depression, because these diseases may co-exist unrecognized. Clinical trial registered with UMIN (UMIN000003470). Chronic obstructive pulmonary disease (COPD) is characterized by progressive and partially reversible airflow limitation, and it is among the leading causes of mortality worldwide . COPD patients manifest a range of comorbidities, some of which may worsen quality of life (QOL) , and others may increase the risk of death . According to the latest version of the Global Initiative for Chronic Obstructive Lung Disease (GOLD) guideline, assessment of COPD should be based on the patient’s level of symptoms, future risk of exacerbations, and the severity of spirometric abnormalities . A number of questionnaires are available that assess COPD-specific health status, including the St. Georges Respiratory Questionnaire (SGRQ)  and the Chronic Respiratory Questionnaire . These are validated and widely used for clinical trials, but they are complex and require special software or licenses to use, limiting their routine applicability in clinical practice. A newly developed questionnaire, the COPD Assessment Test (CAT), offers an alternative to those complex tools . It consists of eight items, each presented as a 6-point semantic differential scale, providing a score out of 40, indicating the impact of the disease. The usefulness of CAT has recently been reported in a variety of clinical settings, such as for evaluating the severity of COPD exacerbations and the effects of rehabilitation [8–10]. However, relatively little is known about the impact of comorbidities on the CAT score of individuals with COPD. A recent study reported that the presence of cardiovascular comorbidity did not significantly affect the CAT score . In another study, the CAT score appeared unaffected by potentially confounding comorbidities including renal failure, obesity, and sleep disorder . A recent study has shown that metabolic and cardiovascular comorbidities may increase in frequency in worse GOLD groups . However, the differential impact of other major comorbidities remains to be investigated. We hypothesized that symptomatic COPD patients exhibiting high CAT scores have unrecognized comorbidities. Therefore, comorbid factors that might have an impact on increasing the CAT score in COPD patients enrolled in a well-characterized cohort study, called the Keio COPD Comorbidity Research (K-CCR), were evaluated. Keio University and affiliated hospitals have established an observational COPD cohort designed to prospectively investigate the management of COPD comorbidities. A total of 572 subjects were enrolled between April 2010 and December 2012, including patients who had been diagnosed as having COPD and at risk for COPD (non-COPD) by pulmonary physicians. Inclusion criteria consisted of (1) age≧40 years old, (2) forced expiratory volume in one second (FEV1)/forced vital capacity (FVC) < 0.7, (3) presence of emphysematous changes on chest computed tomography (CT) scans, and (4) chronic respiratory symptoms with significant smoking history (≧30 pack-years). Pulmonary function tests and chest CT scan were performed in all participants, and the COPD group fulfilled the criteria (1) and (2), while the non-COPD group met the criteria (1) and either (3) or (4) without airflow limitation (FEV1/FVC≧0.7). Excluded were patients who had a history of lung resection surgery or serious complications such as unstable cardiovascular or cerebral diseases and malignant tumors under treatment. For the purpose of this study, only subjects with complete data available for comorbidities (n = 403) were enrolled. All patients were clinically stable and without exacerbations for at least one month prior to recruitment. The protocol was approved by the ethics committees of Keio University and the affiliated hospitals, and written, informed consent was obtained from each patient. Spirometry was performed in all patients in a stable condition using an electronic spirometer in accordance with the guidelines of the American Thoracic Society . Predicted values of spirometric measurements were derived from the guidelines for pulmonary function tests issued by the Japanese Respiratory Society . Regular treatment was not changed prior to spirometric testing. At enrollment, a full medical and smoking history and information about current pharmacological treatment were obtained, and clinical examinations were performed. Comorbid diagnoses were established using clinical history and examination findings, supported by a review of available medical records. All of the following questionnaires were completed by the patients themselves at home, when in the stable state. The Japanese version of the CAT was applied for the assessment of COPD-specific health status, together with the SGRQ in Japanese [5, 15, 16]. The Medical Outcomes Study Short-Form 36-Item (SF-36) version 2 was used to assess general health status . GERD symptoms were evaluated using a self-reported Frequency Scale for the Symptoms of GERD (FSSG) questionnaire, consisting of 12 items. This is known to reflect the severity of the endoscopic findings of GERD , with a cut-off score of 8 points for GERD . Depression and anxiety were assessed at baseline using the Hospital Anxiety and Depression Scale (HADS) . This is a validated screening tool for cases of depression and anxiety in both hospitalized and primary care patients with chronic diseases, including COPD . The HADS consists of seven items for anxiety (HAD-A) and seven items for depression (HAD-D). The scores range from 0 to 21 for each subscale, with a score of 0–7 denoting a non-case, 8–10 a possible case, and 11 or higher a probable case, which may guide referral for psychological support . DXA measurements of bone mineral density (BMD) were performed at the hip and lumbar spine using a Hologic 4500A Discovery bone densitometer (Hologic, Bedford, MA) for 248 of the 336 COPD patients. The T-score was used for the evaluation of osteoporosis, in which a T-score greater than −1 is considered normal, -1 to −2.5 osteopenia, and less than −2.5 is diagnostic of osteoporosis [22, 23]. Data are presented as means ± standard deviation (SD). Univariate associations between CAT scores and other variables were analyzed using Pearson’s correlation coefficient, and Student’s t-test was performed to compare mean values. Stepwise forward and backward multiple regression analyses were performed to examine relative contributions of comorbidities to the CAT score. In these analyses, comorbidities were included as a categorical variable. χ2 analysis was conducted to compare the frequencies between two groups. P values less than 0.05 were considered significant. All data were analyzed using the JMP version 9.0.2 software for Windows. The clinical characteristics of the study subjects are shown in Table 1. Among the 403 subjects in this study, 67 were excluded from the COPD group based on spirometry results. For the 336 COPD patients, all spirometric GOLD stages were represented, with 73 (21.7%) patients in GOLD I, 155 (46.1%) patients in GOLD II, 84 (25.0%) patients in GOLD III, and 24 (7.1%) patients in GOLD IV. The average age of the COPD patients was 72.4 ± 8.0 years, which was older than the non-COPD subjects (66.1 ± 11.7 years; p < 0.001). The COPD patients included 15 never smokers. The mean CAT score and the SGRQ total score were significantly higher in COPD patients than in non-COPD subjects (Table 1). Data are presented as means ± SD. COPD Chronic obstructive pulmonary disease, NS Not significant, BMI Body mass index, VC Vital capacity, FEV 1 Forced expiratory volume in one second, CAT COPD assessment test, SGRQ the St. Georges Respiratory Questionnaire. To validate the CAT in a Japanese COPD population, the correlations between the CAT and SGRQ or SF-36 were examined. The CAT score was significantly correlated to the SGRQ total score and to each SGRQ component score in COPD patients (p < 0.001) (Figure 1). These coefficients (Pearson’s r) ranged from 0.649 (activity score) to 0.810 (total score). When the SGRQ total score was divided into quartiles (0≦and < 30, 30≦and < 45, 45≦and < 60, 60≦) as shown in a previous study , the mean CAT score corresponded to 8.4 ± 5.0, 13.5 ± 5.0, 19.9 ± 6.7, and 27.0 ± 5.5, respectively, and clearly distinguished between the categories (p < 0.001). The CAT score was also significantly correlated (p < 0.001) with all SF-36 component scores; these ranged from r = −0.363 (bodily pain) to r = −0578 (general health) (Figure 2). 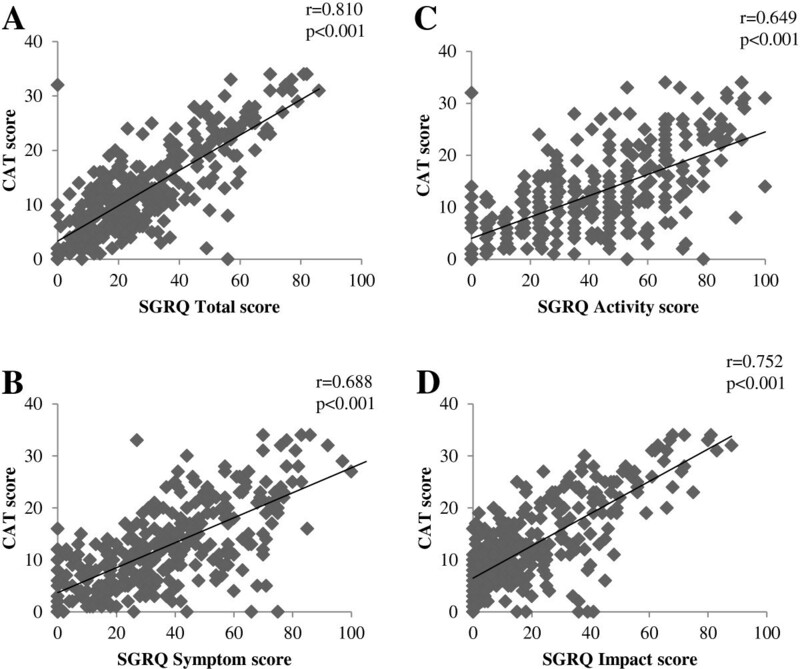 Correlation between CAT score and SGRQ scores in COPD patients (n = 336). A: SGRQ Total score, B: SGRQ Symptom score, C: SGRQ Activity score, D: SGRQ Impact score. Correlations between the CAT score and SF-36 scores in COPD patients (n = 336). A: SF-36 General health, B: SF-36 Physical functioning, C: SF-36 Bodily pain, D: Role social, E: SF-36 Mental health, F: SF-36 Role physical, G: SF-36 Vitality, H: SF-36 Role emotional. The percentage of patients with each comorbidity is listed in Table 2. Hypertension, GERD, and osteoporosis were the three most prevalent comorbidities of the COPD patients. The prevalence of osteopenia was 33% besides osteoporosis. The prevalence of anxiety and depression were 7% and 10%, respectively, and the concurrent prevalence of both anxiety and depression was 3%. There was a significant correlation between the HAD-A score and the HAD-D score (data not shown, R = 0.625, p < 0.001) among the COPD patients. The univariate analysis indicated that COPD subjects with GERD, anxiety, depression, osteoporosis, or arrhythmia had a significantly higher CAT score than those without (Table 2). NS Not significant, CAT COPD assessment test, GERD Gastro-esophageal reflux disease, FSSG Frequency Scale for the Symptoms of GERD, HAD-A The seven items for anxiety of Hospital Anxiety and Depression Scale, HAD-D The seven items for depression of Hospital Anxiety and Depression Scale. Patients with GERD were treated with H2 blocker (9%) or proton pump inhibitor (20%), while those with osteoporosis were treated with bisphosphonate only in 11%. Depression and anxiety were also overlooked and treated with medications only in 20 and 9%, respectively. In contrast more patients with arrhythmia were treated with anticoagulant (33%), antiplatelet (18%), and other medications. Prevalence of other comorbidities and the relationships with the CAT score is presented as Additional file 1: Table S1 including infrequent comorbidities (<5%) and local comorbidities potentially associated with treatment of COPD (cataract, glaucoma, prostatic hypertrophy). Using the results of the univariate analysis, a stepwise multiple regression for the CAT score was then performed including GERD, anxiety, depression, osteoporosis, arrhythmia, age, pack-years, body mass index (BMI), and %FEV1 as variables. The significant comorbid associations with the CAT score were GERD, depression, %FEV1, arrhythmia, and anxiety although each contribution was modest (as indicated by low R2 values) (Table 3). Taken together, these chief comorbidities accounted for about 20% of the variance in the CAT score. Osteoporosis, age, pack-years, and BMI were not significantly associated with a higher CAT score on multivariate analysis. CAT COPD assessment test, GERD Gastro-esophageal reflux disease, FSSG Frequency Scale for the Symptoms of GERD, HAD-D The seven items for depression of Hospital Anxiety and Depression Scale. HAD-A The seven items for anxiety of Hospital Anxiety and Depression Scale, BMI Body mass index. The association of the CAT score with %FEV1 was modest on univariate analysis (r = −0.258, p < 0.001). BMI was also correlated with the CAT score (r = −0.167, p < 0.01), whereas age and pack-years were not related to that (p = 0.17 and 0.62, respectively). In addition the CAT score in the underweight patients (16.9 ± 9.4) (13%, BMI < 18.5) was higher than those in the normal (12.0 ± 8.1) (65%, 18.5≦BMI<25) and overweight patients (11.1 ± 7.2) (22%, 25≦BMI). Although weight loss is associated with various comorbidities and BMI was not related to the CAT score on multivariate analysis, these observations may imply certain association of low BMI with impaired QOL in COPD patients. The CAT consists of eight items, each presented as a 6-point semantic differential scale (Additional file 2: Table S2). Thus, the multivariate comorbid determinants of each CAT item were examined using stepwise multiple regression analysis. As shown in Table 4, no comorbidities were associated with worsened cough or phlegm, but the presence of GERD was associated with higher scores of the other CAT items. The presence of depression was also significantly associated with increased scores of all CAT items except for cough, phlegm, and breathlessness. Abbreviations are the same as those in Table 3. Comorbidities are frequent in subjects with COPD, but the study of their contribution to COPD-related QOL impairment has been limited [2, 12, 24]. In this study, the validity of the Japanese version of the CAT was first confirmed in a well-characterized cohort of COPD patients, since previous studies demonstrated that the SGRQ scores also tended to be lower in Japanese COPD patients than in patients in Western countries . It was found that the CAT performed in a very similar manner to that reported recently in other Asian countries . The mean score of the COPD patients was slightly lower than in studies in other countries [8, 11], but the present population had a higher mean %FEV1 compared to those studies, so they were likely to have had milder disease. It should be noted that there were some discrepancies between the SGRQ and CAT scores in individual patients despite good correlation between these scores at the population level. The discrepancy in the total score appeared to be derived from the differences in the activity and symptom scores, but was within the same range as previously reported (11). In addition the CAT scores clearly distinguished between the quartiles SGRQ score categories. The present study provides good evidence for the validity of the CAT in a Japanese population. To the best of our knowledge, this was also the first comparison between the CAT (a disease-specific measure) and the SF-36, which is a generic measure of health (Figure 2). We therefore believe that our data are generalizable to other languages and countries. The prevalence of comorbidities was then comprehensively examined, and their relationships with the CAT score were assessed among the COPD patients. Among a variety of comorbidities examined, the prevalence of GERD and depression was positively related to the total CAT score. In addition, GERD and depression were associated with 6 and 5 of the 8 CAT items, respectively, worsening overall health status in COPD patients. This finding is particularly important, because those diseases may co-exist unrecognized and untreated. The prevalence of GERD symptoms in the present COPD population was higher than that reported previously in Western and Japanese studies [3, 26]. The significant relationships between GERD symptoms and the CAT draw attention to the possibility that comorbid GERD may worsen the symptoms of COPD, even though GERD may have little impact on mortality . On the other hand, no association was found between GERD symptoms and %FEV1 (data not shown); Mokhlesi et al. reported a high prevalence of GERD symptoms in patients with COPD, with a trend toward it being higher in those with severe COPD . GERD is a digestive disorder in which the mechanisms that keep stomach contents inside the stomach malfunction, releasing acidic stomach contents into the esophagus. Cough can then be induced by the acid stimulus-derived vagal reflex. However, analysis of the relationships between each CAT item and GERD symptoms did not suggest a correlation between GERD symptoms and the extent of cough or phlegm; other CAT items were more closely correlated with GERD in this study (Table 4). We speculate that the occurrence of acid reflux, as reflected by a high FSSG score, might further worsen the health status of COPD patients, in addition to any effect of airflow limitation. Depression and anxiety are well known comorbidities and are independently associated with a higher risk of exacerbations and hospitalizations for patients with stable COPD , as well as a higher risk of mortality . Burgel et al. have recently reported that the presence of depression (HAD-D ≥ 10) was the most important contributor to the SGRQ total score in COPD , but the impact on the CAT score has not yet been clarified. In the present study, depression was found to be a greater cofactor than anxiety for raising the CAT score (Table 3), extending and reinforcing the importance of psychiatric comorbidity in COPD, as previously reported [21, 24]. It should be noted that the prevalence of anxiety and depression was only 7% and 10%, respectively, in the present study, and both are lower compared to a previous study performed in China using the same HADS cut-off  or another study using other measures of depression . The reason for these differences is not clear, but as shown by the CAT score and FEV1, the present population had relatively mild disease. Although the objective measurement of BMD on DXA was performed only in 248 of 336 COPD patients, more than half of the COPD patients showed reduced BMD, with a T-score < −1.0 (51%). The prevalence of osteoporosis (18%, T-score < −2.5) was similar to the most recent analysis of the Towards a Revolution in COPD Health cohort, with 18% in men and 30% in women . Although osteoporosis did not contribute to the CAT score, it appeared to be related to the individual items concerning breathlessness, activity limitation, and confidence to leave home. This is compatible with the awareness that physical activity is a determinant of osteoporosis. The current problem in clinical practice is that many patients remain undiagnosed, because patients are generally asymptomatic until they experience a fracture . The presence of other comorbidities including metabolic diseases, cardiovascular diseases, peptic ulcer, and cancers did not obviously contribute to raising the CAT score in the present study. Although it has been reported that cardiovascular disease is a major comorbidity associated with prognosis in COPD, the prevalence of comorbid heart disease was lower compared to previous studies . It is not clear whether this is caused by ethnic or genetic differences, or by environmental differences, including socioeconomic factors. It is possible that the recruitment of older patients may have resulted in a selection bias by eliminating patients who had previously suffered from severe cardiovascular disorders when they were younger. Another possibility is that lower levels of current smokers in this study (12%) may account for low rates of cardiovascular diseases since smoking cessation is known to decrease the risk of these disorders. There are also several limitations in this study. Dyspnea was not separately assessed using modified British Medical Research Council breathlessness scale, although it is one of the most important determinants of QOL. Exacerbations are also among important determinants of QOL in COPD patients. However, exacerbation frequencies were not included as factors raising CAT scores in the present study. Roles of undiagnosed comorbidities in QOL of the patients should be considered since this study analyzed only diagnosed comorbidities. Rutten et al. have suggested the importance of undiagnosed left heart failure in COPD . In addition COPD patients mostly consisted of men (91%) in this study, and the results may not apply to women. Comorbidities are common in COPD patients and are often overlooked. 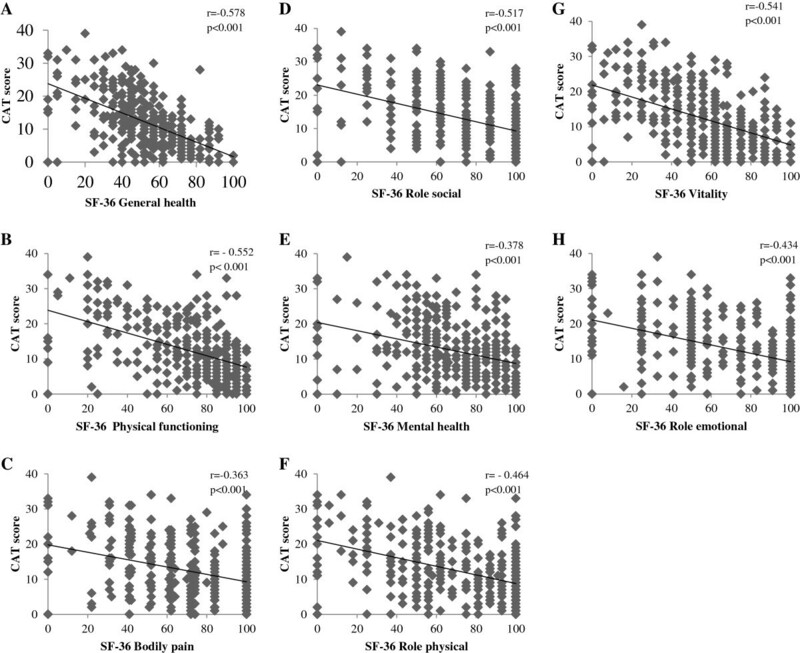 This study suggests that poorer health status, as indicated by a high CAT score, may indicate the presence of certain comorbidities, but the overall picture suggests that COPD-specific measures such as FEV1 and CAT do not reliably suggest the presence of comorbidities, which should be specifically sought. The authors would like to acknowledge Chiyomi Uemura for her contribution to collection of data, and the following members for their participation in the K-CCR Group: Takashi Inoue at Sano Public Welfare General Hospital, Naoki Miyao at Nihon Kokan Hospital, Kazumi Nishio at Kawasaki City Ida Hospital, Hiroki Tateno at Saitama City Hospital, Yoshitaka Oyamada at Tokyo Medical Center, Tatsu Matsuzaki at Tokyo Dental College Ichikawa General Hospital, and Akira Umeda at International Medical Welfare College Shioya Hospital. The authors would all like to acknowledge the late Professor Akitoshi Ishizaka for administrative support for this study. MM participated in the design of the study and performed the statistical analyses, and was a major contributor in writing the manuscript. HN planned the study design, and contributed to interpretation of results. NM, KA, and TB conceived the study, participated in its design and coordination, and helped to draft the manuscript. SC, MS, MH, SY, KT, TS, ST, HK, MN, FS, TT, and KS contributed to collection of data and interpretation of results. PWJ contributed to the data analysis, interpretation of data, and editing of the manuscript. All authors read and approved the final manuscript.